One of the things you must do if you are in the Rapid City area is visit one of the several caves or caverns of the area. A cave or cavern is a natural formation of underground rooms or areas that were created by water running through the underground areas. Many of these caves are accessible and you can take tours of them by guides that will inform and educate you on the history, geology and lore of the particular cave you visit. There is so many things we learned about caves and this one in particular, even though my family is very interested in nature and have learned a lot about them in the past. I personally have visited about a half dozen caves since I can remember, when I was young my family went camping a lot all over the United States and we visited several then. This cave is between Rapid city and Sturgis South Dakota, about 11 miles north of Rapid City. The canyon it is in, Stagebarn Canyon was part of the stage coach route from Deadwood, South Dakota to Sidney, Nebraska. 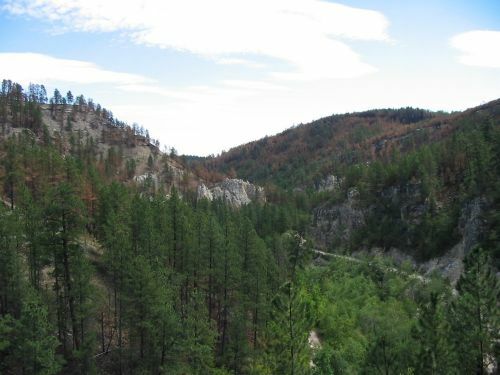 Later on the canyon was used as a route for the narrow gauge railroad to goldmines in Deadwood and Lead South Dakota. 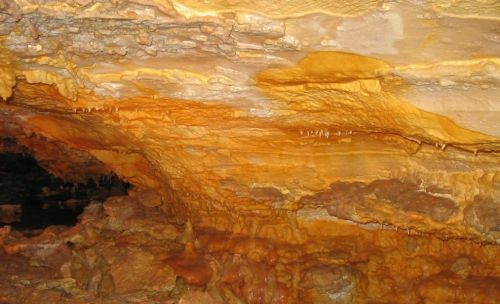 The cave was discovered by Rudolph Stoll in 1924 who was performing geological and geographic surveys in the area. 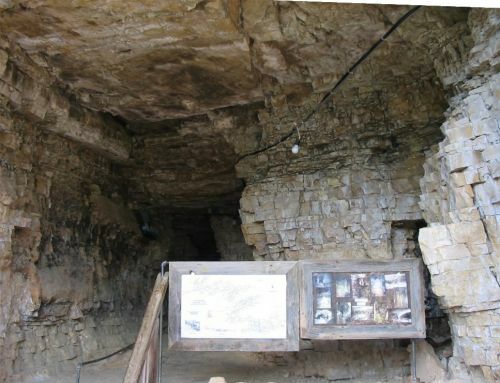 He opened the cave in 1935 after his family had done extensive digging and cutting in the rock to create a pathway that visitors could easily walk along. Today you can see were he did some of this cutting and were he placed some of the rock along paths and inside the cave system. They used hand tools and barrels to cutting and move the rock and crystal they removed. But they did as little damage to this live cave in order to preserve it for future visitors to the cave. A live cave is one that is still forming and creating the natural formations inside the cave, things like stalagmites, stalactites and flow stone are being created as you watch. But you really can't see much growth, it takes dozens of years to add even the barest growth to any of these formations. The cave has been forming for thousands of years and it takes that long to grow things like a few inch long stalactite. When we were sitting on the top of the entry ways scaffolds that are about three stories up from the road into the canyon, the guide told us not to touch anything we saw inside the cave. Later he showed us how this is important for the growth and future of the cave. The cave is alive and continuing to grow, it just doesn't grow quickly. We entered an area inside and he showed us how the cave is alive. Using a black light, he lit an area on a rock that showed fingerprints and smudges that people had left on previous visits, and how it killed to growth of the cave formations. The oil on our hands interferes with the growth and kills the natural formation of mineral deposits that occur on the different types of formations. Also there are things like pools of water that have stopped being dripped into by water from above and have created a mineral film on top, this formation is called cave ice and is very delicate. The film of on top of the water is minerals that were in the water and dried in the very calm air of the cave, this is a rare formation in caves as any disturbance of the water will ruin the film and make it sink to the bottom, it takes literally dozens of years to create this film of deposits and can be ruined in a second by someone poking their finger into it. We started our tour which took about an hour or more and followed the guide as he explained and told us about the cave system. The cave that we visited is on three levels and about a half mile long. It does not feel like a half mile, as you do a lot of walking past narrow ledges and up and down steps that can be slippery. Ducking is a must if you are tall, and can be required unless you like bumps and knots on your forehead. Everywhere you look is something unique and neat. Cave bacon, stalactites, stalagmites, and other terms are tossed around by the guide and you can learn a lot from the visit. The cave has several unique formations that are rare to caves, at least ones that people have visited, one of them that was pointed out to us is two stalactites from the roof of the cave that have formed into one and reaches the floor, this is called a helictite, it is twisted and has been formed over hundreds or even more years. The tour includes many facts about caves and the formations inside them, but also includes many things about how the cave was discovered and the family of Rudolph Stoll formed the walkway through the cave. They used hand tools such as hammers and chisels and carved out the rock to create a path for people to walk along. They then used barrels, about twenty or twenty five gallon size, to load the rocks into and move them either to the entrance or deep into the cave where visitors don't usually go into. The cave at first was used as a source for water for the family who lived just down the hillside of the canyon from the cave. The water is very pure, about 99 percent or more, and is very good for you. Just inside the entrance a little ways is a tank room, an area that has a lot of dripping that has been used as the water source, they used a large tank to store the water and allow the minerals to settle to the bottom of, the minerals are the unpure part of the water. This tank was used as the water for the family as they worked on the cave. Throughout the cave they have added lights, which are turned off after the group goes through each area. The lights are not left on as they would encourage bacterial growth on the walls and it would kill the naturally growing crystals of the cave system. That is about the only man made thing you will see in the cave, lights and rails for holding on. They do not have much else as they wanted people to be able to see the cave naturally and be able to see what a live cave looks like. The cave system is huge when you look at a map of it, one is on the back of their brochure. The length of the surveyed area is more than five miles. Many spots of the map end because the roof of the cave dropped lower than a foot and the kids that were exploring and mapping the area could not go any further. There are spots that are huge in the cave system, but the commercial trail does not go that far. Spelunkers, people who explore caves, have been to these areas and they have said that one area is as large as a football field. The whole cave that we visited was really neat, we had a great time walking through it and learning so much about caves and this one in particular, but to look at the map was another thing. The area that we visited was such a small part of the entire cave system and to know that people have actually crawled and whatever through all of it is incredible. At one point the guide turned off the lights to turn on the black light, and to show us just how dark it really is inside a cave. The only thing you can see is the tricks your eyes play from going to a lighted area to no light what so ever. If you have the chance, and it doesn't matter what one you visit, you should go into a cave and visit one on a commercial tour, it is a time that you will not soon forget and you will learn so much. The Stagebarn cave was a great one to visit and we had a fun and very informative tour.